Join our Cabana Chat group on Facebook to get special deals & giveaways just for group members! 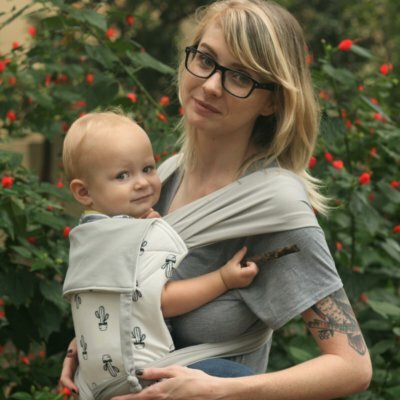 Beachfront Baby Carriers are machine washable and can be machine dried or hung to dry. Fabric is made in China or the US and all production work (cutting, sewing, packaging) is done in South Texas, USA. All orders ship via the US Postal service within 1-3 days using First Class Mail or Priority Mail. US orders shipping time is approximately 2-6 days depending on the option chosen. International shipping can take between 2 weeks & 2 months depending on method chosen. We are not responsible for lost or misdirected packages. Customs fees are the customer’s responsibility. During Pay Pal check-out, you will be required to enter your phone number. This will ensure our international customers' customs forms can be completed, and will be used ONLY in the event that we need to contact you about your order. We offer a 2 year guarantee on workmanship. If your carrier is in need of repair due to manufacturer defect in the first 2 years, we will repair it for you at no cost. •	If you wish to return a carrier for any reason other than a defect, it must be returned within 30 days of receipt & have all packaging included in the return. •	Please contact us for a Return Number and our shipping address. •	Clearance & second quality carriers are NOT eligible for refunds or exchanges. Please read our full Refund & Exchange Policies by clicking the link to the right.